The cabinets you choose are important, because visually, they have a huge impact on your kitchen’s aesthetics. 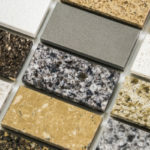 On top of that, they can quickly eat up your budget as the costliest part of your kitchen renovation. First of all, don’t assume you will be relegated to your local big box home store for your cabinetry. The truth is, your local cabinet maker may offer the lowest price on a higher quality product, so shop local first. In fact, you may find big savings in buying from the manufacturer without the middle man at the big box store. 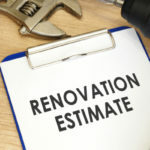 Now, as you discuss your beautiful new cabinets and compare prices at the big box stores and with local craftsmen, be sure to have installation included in the prices. 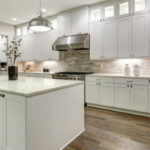 Choosing stock cabinets, standard doors, and regular finishes on the bulk of your cabinets and adding one or two custom cabinets along the way will save lots of money toward the rest of your remodel. Once you’ve found your cabinet source, consider a less expensive wood choice with a high end finish. For example, maple and poplar (and other budget woods) are just a sturdy and mimic the look of cherrywood when finished with cherry stain. Cabinet and drawer organizers are helpful, but expensive. When making your final decisions, compare custom organizers to aftermarket alternatives before choosing. You may be thinking, “quality economical appliances” is a typographical error, but it’s not. Your new appliances are likely the second largest expense in your kitchen remodel, but you can keep costs down. To save money over the life of your new appliances, you’ll want to choose Energy Star® appliances. These high efficiency marvels not only save on energy bills, but many come with tax credits or deductions and even a rebate. Buying your appliances when on sale can also save you money, manufacturers and stores start offering deep discounts on the current year models in September, and the prices go even lower as the year ends, after all they have to make room for the new models. You may find limited stock from which to choose, but the savings will probably be worth it! When shopping, keep in mind that today’s appliances often feature the latest gadgetry, but when making your selection, ask yourself if the added cost for the option will really make a difference. Does your stove top really need a built-in deep fryer? Will you really utilize a refrigerators LED display with internet connectivity? If the convenience will help you save in the long run, by all means go for it, but if not, pass it by. 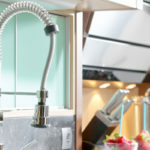 Now, you probably know stainless steel appliances are all the rage, but what you may not know is they cost more than other-colored appliances. And you probably didn’t know, white is equally popular, easier to keep clean, and always in style. If you really want to add color, don’t do it in your appliances, but invest those funds into paint, window treatments, or wall paper, which can easily be changed.